Skanstulls Vandrarhem has been recommended by Hostelworld users for its 'quiet nights' and 'very comfortable beds' in a 'really cool part of Stockholm'. Our guests tell us this hostel is 'very clean, modern and spacious', with a nice kitchen and clean bathrooms and is 'a very safe place with security lockers'. We like that this hostel is off the beaten path but is within walking distance of the city's main attractions, with 'lots of cafés nearby where we could mix with the locals'. Great place to stay , very clean, nice and big kitchen, the staff always go out of their way to help you out .. close to everything , metro, grocery stores etc ..can’t ask for more!!!! Clean hostel with an awesome shower amidst other facilities like a well stocked kitchen. It's located near Sodermalm subway station and has a supermarket just right across the road for food. Helpful staff with awesome recommendations for first timers like us to Stockholm! Our group of four was allocated the same room and we were allowed early check-in. Definitely will recommend all to stay here! I loved my stay at Skanstull Hostel. Staff were lovely, kitchen was well equipped and spacious, location was unbeatable. Would stay here again without a doubt! The hostel was well-equipped, had a lovely social area and the beds were comfortable and clean. The toilets were also very clean, and the shower was clean apart from some hairs on the drain. They provide free tea, coffee and pasta which is a really nice touch. They are also super helpful when it comes to bag storage before/after checkout. Would definitely recommend, and would stay here again! This is a very good place to stay, cause it’s really close to metro station and many bars, restaurants and a shopping mall. Perfect location! However, there are some negative aspects I have to mention. Common areas are super super dirty. I didn’t see any cleaning staff! The kitchen was super dusty and with some leftovers on the floor! Showers were as well dirty, I‘ve used the same cabin to shower everyday and it wasn’t checked AT ALL! So bad :( It’s a cool place tho. Nice enough and clean enough for a couple of night stopover in Stockholm. 30min walk from the old town, and quite far South in Södermalm. In the common areas atmosphere was quite nice but don't expect the rooms to be as nice as in the pictures. A lot of noise from the streets. The location was average. Close proximity to metro station but not anything eye appealing around it. There was no hangout room besides the kitchen, but the layout was poorly built and usually dirty. Worst part was that they didn’t display anything to do around town. It’s something I expect from Hostels. They had literally nothing written down on the To do list on their planning board. Also, they time the showers so they turn off every 2 minutes. 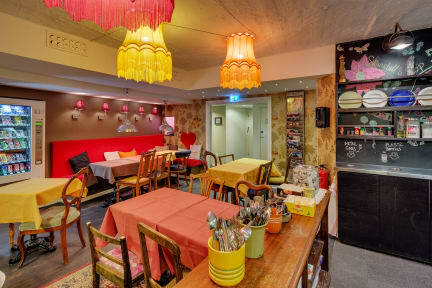 What makes us special is that we're a genuine hostel located in the middle of a genuine part of Stockholm. We love Södermalm, and so will you! Here's the place where you can stroll around with the locals, the hipsters and the bohemians. The waters are always close and so are the parks so there's a festival feeling every (non-rainy) night of the summer. I think our cool location in town, near SoFo, is among the best things about us.